Banquet Tables Pro® lighted highboy cocktail table features a white top with affixed RGB LED lighting. Just put the stretch spandex cover on the table, and use the remote control to choose your glow color. 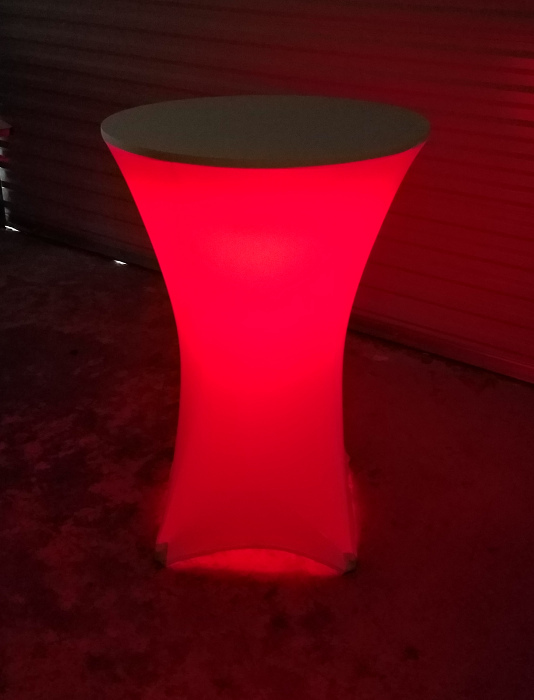 Includes: 30 round x 42" height table, affixed lighting, battery & charger, remote control & 1 table cover. Just connect the battery, put the table cover on, and your all set! Portable: The Base, Pole, & Top all fit together & breakdown without screws or tools. The Battery: Will last for more than 12 hours. Changes Color: The remote control changes the light to any color you like with the click of a button. You have 20 standard remote controllable colors as well as the option for custom colors. The Affixed Lighting: Has 18 RGB LED Lights, with heavy duty clear impact resistant cover and frame.